Sticking with purely financial expression of the eurodollar standard it is easy at times to forget such monetary influence has very real consequences. That is true in the US in particular, as even though the recovery is both deficient and waning it isn’t the disaster it is in other, connected places. 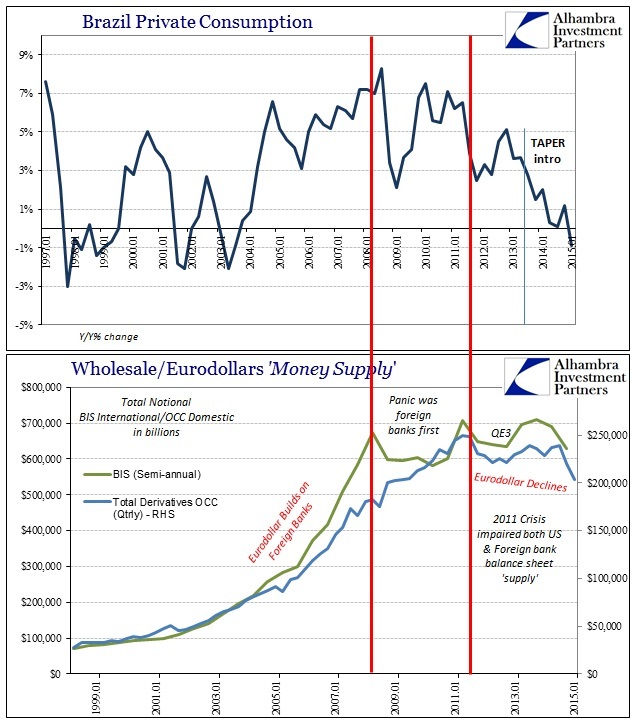 It was, after all, the rise of the eurodollar standard as a wholesale system starting in the middle 1990’s that more tightly stitched the global economy, an open system architecture that eludes, still, the grasp of monetary policymakers. As such, they have a great tendency to miss and misapprehend what is really happening and because of that they will simply make it all worse without much hope for an upside. The most evident example of the rise and fall of the eurodollar standard is China, but Brazil is no less compelling in that respect. Ever since the middle of 2013, when Ben Bernanke scared himself about bubbles and hoping the economy would finally act as it was supposed to, the “dollar” system has attained this broad, global withdrawal. The system was fatally wounded in 2007, that further emphasized in 2011, but it wasn’t until the middle of 2013 that a critical threshold of upheaval was seemingly passed – a sort of economic point of no return. The initial response from Brazil’s perspective, as the real sank from about 2.00 to the dollar to 2.40 to the dollar, was as the textbook orders (the Brazilian version of the orthodox textbook, anyway). The nation’s central bank, Banco do Brasil, launched what were called currency swaps but were really something else – long story short, it was the means (cupom cambial) by which to influence local banks to import more “dollars”, the practical effect of which was to incentivize Brazilian banks to increase their “dollar short” at a time when the short was the problem. Such a monetary response is by nature limited, as it was only intended to buy time where this perceived imbalance would clear. Banco left the swaps on for just over a year, figuring, as the FOMC did in the US, everything had been achieved. By September 2014, that looked to be the case in Brazil, as the real stabilized and the economy, after suffering an “anomaly” in early 2014 related to 2013’s currency upheaval, appeared at least weak but not getting worse (GDP fell sharply in Q2 2014, -1.4% and then rebounded a little in Q3 and Q4 at +0.2% and 0.3%). In early September last year, Banco reduced its swap “influence” based on that perceived balance, misunderstanding the larger implications of the global eurodollar upheaval that had renewed that June. Almost immediately, the real started to sink and it has not much stopped ever since. By March 2015, the real had crashed past 3.20 to the dollar, far, far more devaluation than imagined when the “swaps” began in 2013, but Banco really had no choice but to end them – ridiculously declaring their great “success” as they did so. 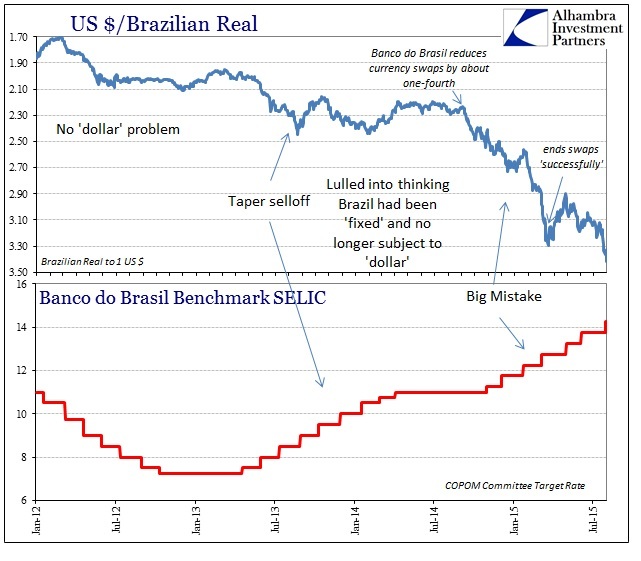 Brazil as an economic system caught up in the eurodollar standard was instead simply doomed alongside it. The country’s economy, as China’s, was built in the 2000’s by that financial factor almost exclusively, so its fate has been intertwined with eurodollars for more than a decade. Thus, we can easily observe both its rise and fall related to nothing more than the rise and fall of the “dollar.” The cost in 2015, however, is proving far worse than even the Great Recession as that is the massive downside to such unbridled and global financialism; artificial stability leads to intermittent and dangerous instability and finally to nothing but instability. Central banks have only to get in the way and make it worse, which they are doing as steadily as they can. In other words, these are not currencies by which currencies are traditionally understood but rather measures of the eurodollar/wholesale combination of chained liabilities determined under the eurodollar standard operation. As I mentioned at the outset, the cost of this systemic reset is mostly hidden from the US perspective, especially from the view of asset inflation and US bubbles. That likely will not last, as eventually reverberation (in concert with domestic and related attrition) will ensure more negative harmony around the globe (assuming, of course, it hasn’t already). The damage is quite severe even now, but more worrying is that it appears nowhere near the bottom. Industrial production dropped almost 9% year-over-year in May (the latest figures) as auto production is down an enormous 20% since January alone! Curiously, like so many other places touched by central bank intervention, despite these numbers unemployment has yet to rise significantly. That may be a matter of time, as even consumer spending and the internal sector find new multi-decade lows. 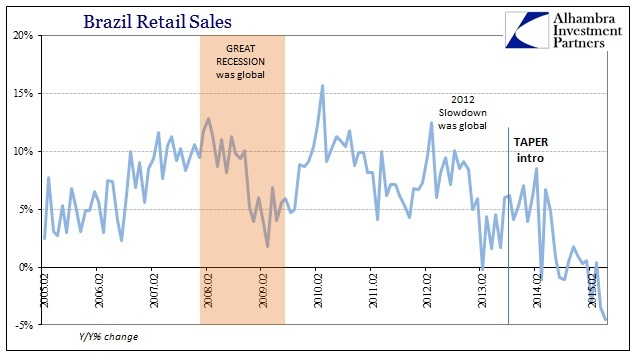 Retail sales collapsed 4.5% in May, by far the worst decline in the series – more than 6% below the worst month of the Great Recession (the first generalized outbreak of instability of the eurodollar). But that might not even be the fullest measure of the high cost of this financial retreat, as the economic decay is now more than two years old and counting. In other words, the Great Recession was sharp but over with relatively quickly. 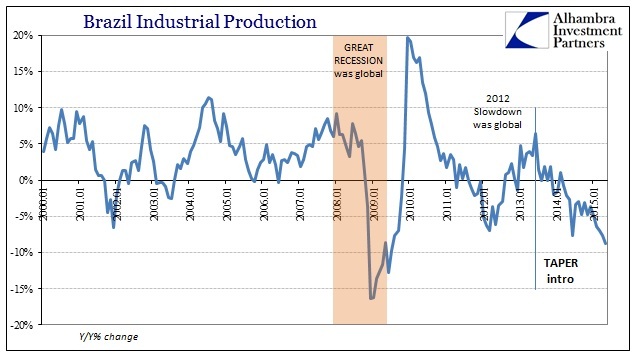 Industrial production, for example, was falling at more than 15% at the trough of Brazil’s end of the Great Recession but the decline lasted only twelve months. The current episode has industrial production at or below zero for 22 straight months; again, with no end in sight. So the actions of each central bank are simply swallowed into this eurodollar vortex (in the US, all the “missing” inflation apart from easily swayed asset prices). The downside is not just actual volume destruction within the Brazilian economy, but also greater misery for Brazilians by way of consumer inflation. Unfortunately for Brazil, the great instability of all this financialism is breaking out in almost every form imaginable simultaneously. The official “target” is for 4.5% “inflation”, an estimate not seen in years. 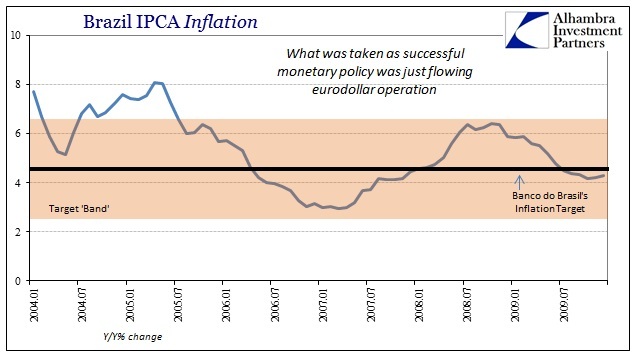 More recently, the IPCA calculation has not just exceeded the upper “limit” of the policy band but exploded into the highest rates in a dozen years. That is perhaps the worst part of all this, namely that “inflation” during the height of the eurodollar standard seemed to confirm the genius of central banking. 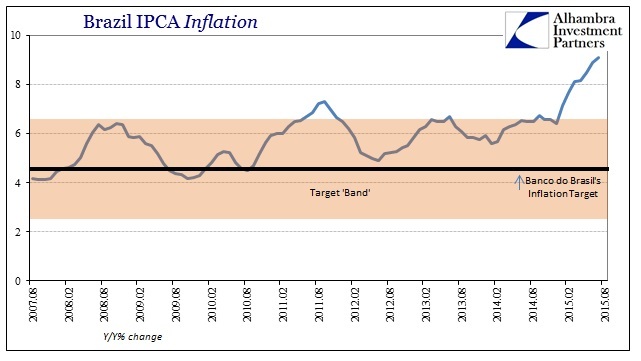 In Brazil, from 2005 through 2009, the IPCA inflation rate averaged 4.6%, right at the central bank’s target. From that, Banco do Brasil reasoned itself a great and successful engineer of economic fortitude when in fact it was only adding to the hidden instability of the entire regime as well as fooling itself about how the economy was actually moved marginally. Now that the instability has finally broke out, systemically, Banco can’t do anything right even though it is in practice taking all the same textbook steps that it did during the eurodollar’s apex years. Like we see here and everywhere else, central banks were never really directly responsible for the Great Moderation apart from shirking their primary duty to stop it; they instead embraced it as if it were consistent with the various stability mandates when it was nothing but artificial, financial fill that was later revealed as a highly imbalanced and now unstoppable in retreat. What looked like a virtuoso monetary performance on the way up is revealed very much as only capable of making a bad situation worse on the way down. The costs of the eroding eurodollar are quite severe if somewhat limited at the moment. Somehow, ignorance of all this is used by central bankers and economists alike as assurance why the economy (in singular locations, as well as the global economy) will just rebound after “unexpected” weakness. As with looking past GDP, a more comprehensive perspective provides both the explanation as to why “unexpected” isn’t and a basis for what might come next. If we sum all of this up: the Brazilian central bank is aiding in the effort to short the real while the dollar will continue to rise against it as eurodollar funding markets process volatility driven by Bernanke’s attempt to undo the bubbles he finally sees as FOMC creations. I don’t see any realistic paths to how this will end well. Central banks do not “calm markets”, they are the creators of instability in the first place. Any calm engineered by central bank intervention is as artificial as asset bubbles, and will get reversed in due course. Unfortunately, that proved to be almost underestimating “reversed in due course.” Brazil, unfortunately, hasn’t yet reached its most blackened scorching, and worse is a stark lesson in 21st century financialism that still isn’t being heeded anywhere.